Set out pirate decorations starting at the pool gate and continuing along the walk way on to the patio or pool area and food table. 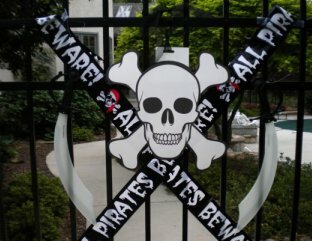 Place a pirate flag at the entrance to your home or hang it on the pool gate to welcome (or warn) your party guests. Use the flags as a pirate decorations out front to identify the "pirate house" and on the sidewalk leading to the pool or backyard area. If you have an arbor hang it from there. You get a lot of bang for your buck with this 100' pirate pennant. You actually get 4 dozen 1-ft. x 18" plastic pennants. I love to decorate with plastic outside - so if it starts to drizzle it doesn't matter or you can start decorating a day a head of time. 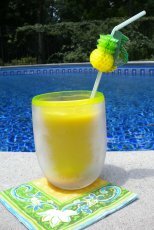 Pennants work great to decorate the pool fence or deck railings. Hang them across the party table or line the driveway with them. Let Black Beard himself greet your guests. At almost life size pirate - 55" - he will keep his eye on anyone who tries to steal his treasure. Made of cardboard, the cutout is jointed so you can adjust his appearance anyway you want. Sturdy and colorful, include him in your party decorations. Invite Sea Dog to your pirate party. While this 6' pirate makes for a great prop, you can be sure he will find his way into the pool. But what fun he will have swimming with his matey friends. Set him up at the entrance to the pool to greet your guests. He will provide an awesome first impression that will get everyone excited about your party. Get a dozen pirate beach balls. Have them floating in the pool when the guests arrive. Write a guests name on each beach ball. To get the pool games started instruct everyone to go find their beach ball. These inflatable balls come in several sizes - mini-beach balls at 7", and there are also 9" balls and 16" beach balls. Scatter foam gold coin stickers and jewels or other pirate coins on the sidewalk leading to the party area. We could hear the kids exclamations as they discovered these treasures, picking them up along the way. As the kids left the party, these treasures continued to delight and entertain. These gold coins can be used in lots of other ways as well. Use them to decorate the party table. Hide them for a scavenger hunt, put them in the party bags or use them in a treasure chest. They come 144 pieces in a bag for less then $5.00 at Amazon. Fill your treasure chest with gold coins and jewels. There are about 16o pieces and the jewels are approximately 1" long and 3/4" wide. They are made of plastic and come in an assortment of colors. Use any extras for a scavenger hunt in the yard or for party bags. 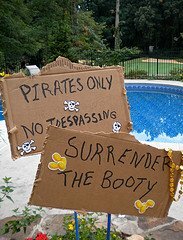 Make signs as part of your pirate party decorations. Place them along the path or sidewalk. Use old cardboard boxes and tape the sign to a wooden dowel. Add a couple of pirate stickers to it. Use pirate sayings like, Surrender the Booty, Pirates Only! No Trespassing, Walk the plank wench, or Dead men tell no tales. Put them in the ground or in planters near the party area. You can also use this Beware Of Pirates door cover. It's made of plastic so it doesn't matter if it gets wet. Hang it on the pool gate . The sign measures 30" wide X 60" high, but can be trimmed if needed. Also put one on a section of your fence to be used as a photo op. 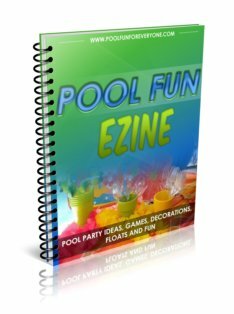 It only costs about $6 and provides a big party impact. Use plastic Pirate's Beware Tape. We put ours on the pool gate. It is the first thing that guests see when arriving, so it is always decorated as a way of saying, "Here's the Party - Enter Here." Buy two pirate hats for pirate decorations. I inverted a kids pirate hat and used it to hold the napkins and silverware. 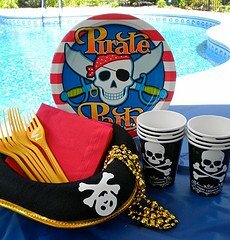 The second hat was used to hold the clues for our pirate party games. We let the birthday boy take home one of the hats. 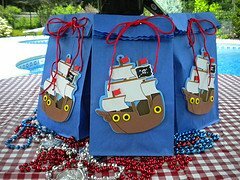 The pirate party bags were placed on the party table and served double duty as party favors and as the table centerpiece. A couple of "jeweled" necklaces were scattered around the bags. You could also scatter gold coins. Blue lunch bags from Target were used with a ship foam sticker craft from Oriental Trading. Since the disposable tablecloths don't work that well on patio umbrella tables, I found these red and white checked plastic umbrella tablecloths for less than $3 at K-Mart. It wipes up really easy and can be used again.